Not only do I have the treat of turning 41 in a few short days, it's also time to renew my driver's license. I decided to take as much control of an iffy situation as possible. I planned to visit the DMV right after my long overdue hair appointment this morning. My stylist worked her magic with some dabs of color, snips of scissors and the miracles known as a round brush and blow dryer. I left the salon with a spring in my step. And then this caught my eye in the car parked right beside me. I heard some of the stylists chatting and laughing about someone (maybe a client? a worker at a nearby shop?) who drives with an, ahem, inflatable um...friend to ward off hooligans and trouble with a Capital T when she drives alone. 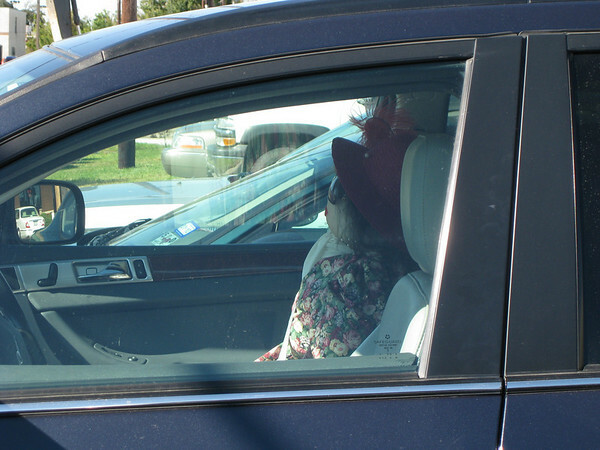 I'm not sure if it's the red feathered hat or flowered print dress that sends shivers of fear down the the spines of any potential carjackers. I could not resist snapping a picture. I then made my way to the DMV. See? Thankfully, there were no lines at all. I was in and out in, like, 10 minutes and became an organ donor to boot. Fingers crossed my driver's license picture turns out decent since I'll be stuck with it for the next six years. Why aren't there mirrors at the DMV? Or test shots? Or retakes? By the way, here is my new do. It's basically the same angled bob thing, just shaped up and a few kicky bangs. Maybe I should get a red feathered hat? The inflatable doll is way creepy, if nothing else it would warn potential car jackers that they probably don't want to get involved with someone willing to drive around with something like that. 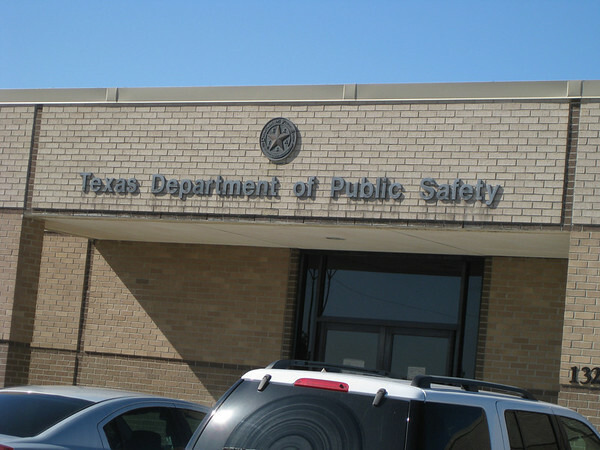 You look rather sassy with your new hair-do, I'm sure your new license will look great! i've heard of people driving with a doll in their passenger seat so that they could utilize HOV lanes. do NOT get a red feathery hat. do. not. Cute 'do! Lucky that you only have to renew q 6 years there-- here is's 4! I dread the day I have to renew my DL. Not only do I always hate the picture that has to come out but I have to take the vision test. IFFY. These crazy biofocal contacts drive me nuts. Do you realize more people see your DL picture than any beautiful family photo you ever took? LOVE your hair. all I can say is that doll is scary! Where in the world do you find something like tha?? ha! You work the angled bob, girl. I think it's a great style for you and I love the kicky bangs. In Maryland you can opt to use the same picture as before - pretty nice when you have that rare good one. And you get to look 5 plus years and a few pounds younger - not bad, huh? Love that hair-do. The doll...notsomuch. for a while my sister in law drove around with a giant Wile E Coyote which we inherited when the kids were younger!